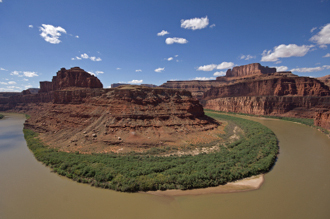 The Potash/Colorado River Scenic Byway gives you an opportunity for some wonderful views of the Colorado River north of Moab. You can also see a variety of ancient rock art and even some dinosaur tracks. The drive one-way is 17 miles (27.4 km). Allow at least an hour for the drive in and back. Yes, there are many more well-known scenic byways in Utah, but if you’re in the Moab area, this drive is well worth taking a little time for. The byway starts at a point 4.1 miles (6.6 km) north of Moab. Watch for the sign for Potash Road (U279) when it turns off Highway 191. After driving a little less than 3 miles, the Potash/Colorado River Scenic Byway enters the Colorado River gorge. Another mile or so and you’ll see Wall Street. These are sandstone cliffs where you’re bound to see rock climbers. The most popular climbing area in southeast Utah. It’s what its name implies … a 500 foot sandstone wall. At 5.1 miles (8.2 km), watch for signs directing you to pull off. You can see some amazing rock art petroglyphs on the cliff walls. There are additional signs providing information about these rock art panels. In fact, you can see the art from your car. You don’t even have to get out. Rock art was left by several different peoples … prehistoric and historic … over thousands of years. 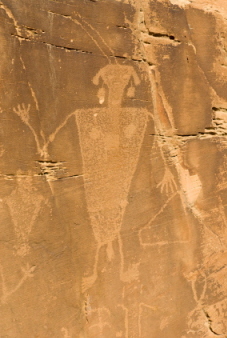 The Moab area is an absolute gold mine if you’re interested in viewing more Native American rock art. Drive a little further along the Potash/Colorado River Scenic Byway and you’ll come up on the Copper Ridge Sauropod Dinosaur Trackway. This amazing display contains the tracks of a turning brontosaur and four carnivores. The trackway was discovered in 1989. The tracks are 8 to 15 inches long and three-toed. And they tell an amazing story. Bring a pair of binoculars and tread lightly. At 9.9 miles, you’ll see parking for the trailhead to Corona and Bowtie Arches. It’s a relatively short hike to see them … 1 ½ miles out, 3 miles round-trip … but well worth it if you are able. 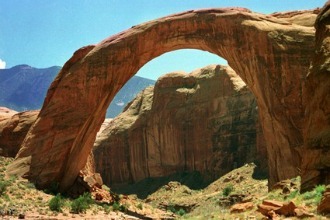 Corona … often called Little Rainbow Bridge … actually has an opening of 140 feet by 105 feet. Not little. A classic slickrock setting. A 22-year-old thrill-seeker died recently … in March of 2013 …on “the world’s largest rope swing” dangling down from Corona. He miscalculated and swung on a rope that was too long. This swing has been touted on YouTube as the “granddaddy of all cheap thrills” with tour operators leading the way. Those tour operators have now been banned from aiding people who want to play Russian roulette. At 13.5 miles (21.7 km), you’ll see Jug Handle Arch. No, not the one in Zion National Park. Definitely not a highlight of the drive but it is an arch. And it does have a name. Just beyond this point, the canyon widens and you can see the awe-inspiring cliffs below Dead Horse Point State Park in the distance. The paved highway ends at the Intrepid Potash Mine. Potash … a mineral most commonly used to produce fertilizer … is mined here using a unique process. Originally started as a conventional potash mine, it was converted in 1971. You’ll see the large ponds. Solution mining … water pumped underground … is used to extract the mineral. Then the potash brine is pumped into open solar evaporation ponds. Intrepid has three such mines: Moab; Carlsbad, NM; and Wendover Nevada. If you want to continue on into Canyonlands National Park, you’ll need a high-profile vehicle …preferably a four-wheel-drive. If not, head back the same way you came.